Elliot was a little more enthusiastic about riding the Hat City Cyclefest on June 14th, 2015, because we didn't have to wake up so early since it started in Bethel and was only 15 minutes from the house. No matching jerseys this time because he doesn't like zippered fronts. We met Will and his daughter Julia at the start point and took off. 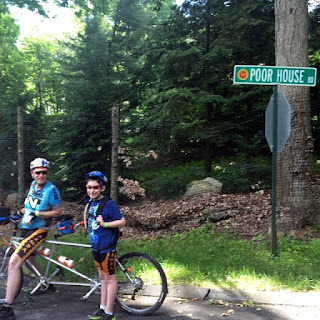 The course we were riding was the 23 mile route which headed south into Newtown by way of Route 302 and then over into Redding by way of Hopewell Road and then down one of my favorite roads, Newtown Turnpike. Then it was back up Route 53, then cut through West Redding and up Long Ridge Rd, wasn't expecting that but it did take us off a busy road, then cut through Bethel and back to start. We started out strong but Julia, having ridden mostly in NYC, struggled on the hills. Will took this picture of us waiting for them. 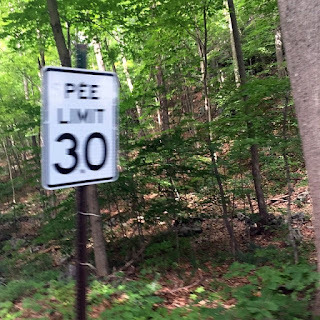 with the new Pee Limit law they passed last month! Down at the Saugatuck Reservoir we stopped to marvel at full the reservoir was. I haven't see this much water in the Saugatuck in 20 years! At the food stop, while waiting for Will and Julia to catch up we noticed that there were other riders from another event traveling along the same route. Apparently the Bike MS ride from Sherwood Island was using many of the same roads that we were. They also had a rest stop somewhere on Route 53 but it was up the road further. Yet, quite a few people stopped here thinking it was for them. After eating we hung out in the shade waiting for Will and Julia to finish their ride. Elliot was extremely bored and famished because there wasn't much post ride gnosh that he could eat because of his food allergies. Next time, I have to remember to bring another chain, some more snacks, and of course something to keep him busy. Of course we chatted. We chatted a lot while riding together, too. I think that is why he likes to ride the tandem because it gives us the opportunity to talk about everything going on in our lives. He has such a unique perspective on life.